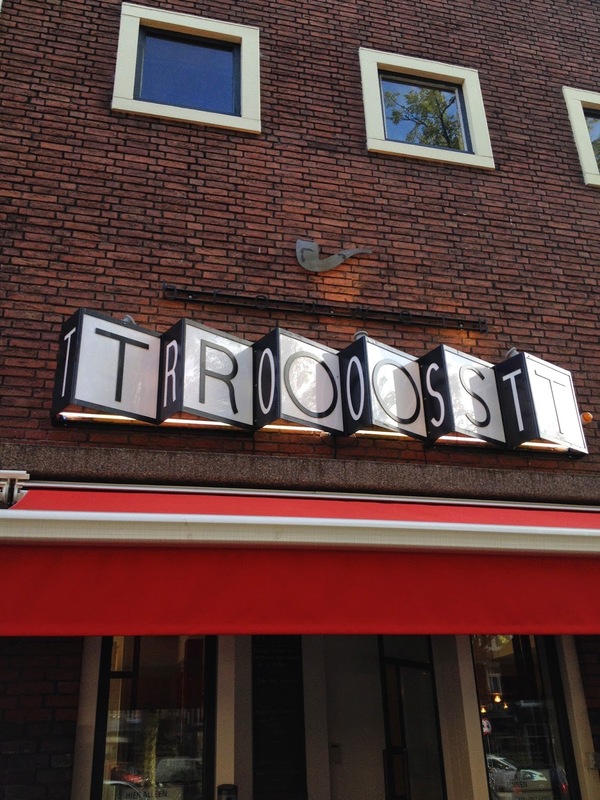 If you are looking for a delectable place to eat a hearty meal, while also enjoying a pleasing visual aesthetic in the process, look no further than the Brouwerij Troost. Located on Corneils Troostplein, just a stone’s throw away from the Albert Cuyp Markt, the brewery/café has a mouth-watering selection of house beers, handcrafted burgers, specialty menu items, salads, desserts, and other fine foodstuffs. Upon approaching Café Troost, the first thing one notices is the new age looking, three-dimensional sign hanging above the restaurant. The restaurant certainly seems like an exceedingly cool place at first glance. The content customers drinking beer outside the restaurant make one extremely eager to sample what Troost has to offer. The café is extremely inviting on entrance. At the time of my visit to the restaurant, smooth jazz music playing at a just audible volume permeated the air (this would later alternate with rock and light punk music, giving the ear different acoustical sounds). In addition, candles glow brightly on the tables, creating an intimate yet open space, and waiters walk by with smiles on their faces. The visual aesthetic of the restaurant appears exceptionally appealing. UFO-shaped lights hang from the ceiling, which adds to the new age effect the outdoor sign portrays. The sun shines off the numerous clean and clear windows under yellow awnings, which gives the inside of the restaurant a warm, yellow-tinted color. A mixture of high-top tables, seated tables, and cushioned benches diversify the seating arrangements (and gave me additional bonus and thrill of picking the seat that I wanted). The bar is extremely impressive—five large kegs rest on top, and copious amounts of cups, wine glasses, pitchers, and carafes litter the bar table. This display greatly enhances the credibility of the restaurant (and convinced me that I had to enjoy a beer with my meal). The restaurant makes it tremendously easy for its Dutch-speaking patrons to decide what to order. The menus (only in Dutch) are neatly laid out, with drinks on the front and food on the back. Signs (also only in Dutch) with special drinks and foods-of-the-week line the restaurant, so one can learn about the specials anywhere he/she looks. For those that do not speak Dutch, fear not! All of the waiters speak English, and are more than capable of answering any questions one may have about the menu or specials. In fact, all three waiters that I interacted with over the course of the meal smiled greatly and were very accommodating and engaging, significantly enhancing my eating experience. The restaurant boasts four specialty beers, along with six burgers and a host of salads and other specialty items (including steak fries and prime rib). I ordered the newest kind of beer, the Saison, and the classic burger (upon my waiter’s recommendation). Immediately after he left, another waiter came to my table and provided me with a napkin and silverware. I was immensely impressed with the speed of the service; in fact, service for the entire meal was fantastic: as soon as I finished my meal (both entrée and dessert), another waiter came, took my plate away, and asked if I wanted anything else. This rapidity allowed me to relax and digest my food in piece (without dirty dishes), while also making me feel that I truly mattered as a customer. Approximately 15 minutes after ordering, my appetizing classic burger, complete with a side of fries and jalapenos, arrived. The meal was neatly laid out on a wooden platter, with no clutter or mixture of the different foods (a presentation that I certainly enjoyed). The appearance was impressive overall, and created an additional level of excitement. With a full head of steam but an empty stomach, I dove in. The fries were exceptionally warm and crunchy at the ends yet soft in the middle, and with the mayonnaise dip, served as a perfect contrast to the thick, juicy burger. The burger itself contained bacon, spinach, tomato, pickles, onions, and a mayonnaise/mustard condiment mixture. The meat was ground up with parsley and other herbs, and had the appearance and taste of being prepared and cooked just outside the restaurant 15 minutes ago. The vegetables were organic and extremely crisp, and went very well with the ground-up beef. I was exceedingly satisfied upon completion of this glorious entrée. For dessert, I felt another small pang of hunger and ordered the house brownie. I fully expected a standard brownie to be brought to me. However, what actually appeared shocked me to my core, in the most enjoyable possible. On the plate came two brownies, topped with macadamia nuts and peanut shavings, as well as two dollops of caramel ice cream, blueberries, and raspberry sauce. The brownie was so rich that my almost did not cut through the brownie. The combination of the brownie, ice cream, berries, and sauce was a symphony of flavor in my mouth, and sent my taste buds for a wild ride. 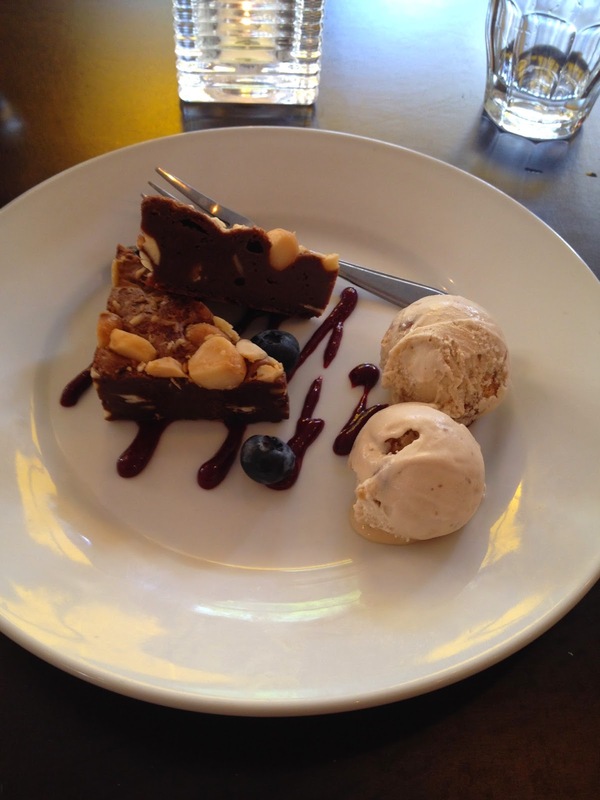 For those eating at the café, strongly consider ordering this delectable little devil of a dessert. The brownie was an excellent way to finish off my meal, and left me sufficiently full and content. The food was fairly priced (although the restaurant only takes cards—no cash). As I left, I noticed various posters around the restaurant with upcoming concerts, events, etc. (also only in Dutch). Overall, the Brouwerij Troost was an excellent restaurant with delicious food, exceptional service, and pleasing visual aesthetics. All these factors combine to make Troost an extremely enjoyable place to eat a fine meal.